Why do I do them? What drives me to compete, when we could be free surfing with friends? These are questions I have often asked myself, when I think about the best times I have had surfing and the best waves, not one of them has been in a contest. 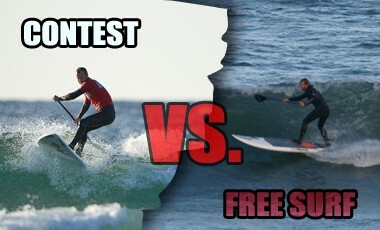 Contests put a boundary around the freedom of surfing so why on earth would anyone bother? Now that I am just back from the Watergate Bay SUP surf contest, where I managed to reach the final, I wanted to reflect on what motivates me to take part. I can only speak from experience, I have been a surfer since my teens (and growing up in a rural area between Birmingham and Coventry this has been no small feat). I went to school during the teacher strikes of the 1980’s, any extra curricular activity (such as team sports) ceased as the teachers worked to rule. As a consequence I came out of secondary education without a competitive bone in my body and my interest in sport centred around skateboarding in Coventry and Birmingham. A serious leg injury on a half pipe put pay to the skateboarding, but during the physiotherapy sessions that I attended one of the staff asked me if I was going to skateboard again. “definitely” I replied “its what I do” (we are so pretentious when we are young!) she said “why don’t you try surfing, at least when you fall off its soft”. That is where the bug started (and its not always true that its soft when we fall off). After moving to Wales and going through the rites of passage when you learn to surf I saw my first surf contest at Llangenith beach. I was actually in the line up watching the contest from behind the waves as Carwyn Williams and Chris French battled it out. It was a defining moment as my surfing at the time was stuck in a rut, I had reached a plateau where I was not improving (I have since learned that such plateaus are extremely common in sport). I needed something to help me progress and I thought a surf contest was the way forward. I signed myself up for a contest down at Fistral beach in Cornwall and myself and friends made the long drive South. Surfing against people who were in a different class than me was both inspiring and at times depressing, but I came away from that first contest determined to get better and to get fitter. Through just talking to other competitors I picked up so many great tips (such as changing my board as it was not built for UK conditions and move my back foot further back when going for big turns) and I was hungry for as much information as I could absorb. When I was feeling particularly down after I was knocked out of the contest one of the other surfers said, “don’t worry, just think that wave has travelled hundreds of miles for you to get to surf on it, losing a heat in a competition is pretty meaningless in the scheme of things” and this has turned out to be pretty much true. Photo below: Neal Gent and Matt Argyle getting ready to compete. Photo: Richard Marsh. When SUP came arrived on these shore I bought an 11ft Jimmy Lewis and got stuck into learning another sideways sport, I remember bumping into Neal Gent (current British SUP surf champion), who turned out to be one of my neighbours, in the local line up in 2007 when SUP’s were a novelty. I knew that I wanted to compete in this sport as I that would be the motivating factor for me to improve and not get stuck in a rut with my surfing, and it has definitely happened. I clearly remember the first UK SUP contest in September 2007 at Watergate Bay, with everybody coming together and bringing their backgrounds and styles into one place. The SUPer that really impressed me was Brian Talma, he had a really smooth style and used the paddle all the time to initiate turns, at a time when most people were twirling it over their heads. Recently the sport has started to evolve again with shorter and more aggressive riding starting to appear (and that is how I am surfing now as well), where as in the past the long boarding style dominated. By going to the contests and taking part I have learnt where the sport is heading, seen other riders in action and been very inspired by them (Adam Zervas, despite being very unlucky to be knocked out of the Watergate Bay contest, borrowed the same Nah Skwell board that I have and I watched him pull off moves that combined short board and long board style – now I am working on this side of my surfing). I have also seen competitions bring out the worst in people, buy me a beer and I will tell you some of the stories, but looking at the SUP surfing “contest scene” holistically I believe it brings out the best in people, and you make some of the best friends you could wish for by being part of it. Other photos thanks to Simon Bassett at 2XS and Bob Berry.